Sea-to air-combat, surface attack, anti-submarine warfare, Search and rescue, aerial reconnaissance, weather observation, and material transportation. 1960 saw the No.300 White Tigers Squadron, consisting of Sea Hawks aircraft being commissioned. In the very next year (1961), INS Vikrant (formerly HMS Hercules) was acquired by the Indian Navy. Vikrant's initial airwing consisted of British Hawker Sea Hawk fighter-bombers and a French Alize anti-submarine aircraft. On 18 May 1961, the first jet landed on board, piloted by Lieutenant (later Admiral) R H Tahiliani. That year, the No.310 Cobras Squadron (consisting of Alize aircraft) was commissioned. After playing an important role in several major Indian military actions, specifically the liberation of Goa and the India-Pakistan war in 1971, she was decommissioned in January 1997 and turned into a museum ship. In 1976, the Indian Air Force handed over Super Constellation aircraft to the No.312 Albatross Squadron in Dabolim, Goa. Being fairly old aircraft at that point, these were withdrawn from active service by 1983. To replace them in the maritime patrol role, Soviet aircraft were acquired. The No. 315 Winged Stallions Squadron was commissioned in 1977 with the Ilyushin Il-38 aircraft. In December 1961, INS Vikrant participated in Operation Vijay, the liberation of Goa from Portugal. Its role was primarily to deter foreign naval intervention during the 40-hour-long military action. INS Vikrant played a major role in the successful naval blockade of East Pakistan. Stationed off the Andaman & Nicobar Islands escorted by the Leopard-class frigate INS Brahmaputra, as well as INS Beas, Vikrant redeployed towards Chittagong at the outbreak of hostilities. The morning of 4 December 1971, the eight Sea Hawk aircraft on Vikrant launched an air raid on Cox's Bazar from 60 nautical miles (110 km; 69 mi) away. That evening, the air group struck Chittagong harbour. Other strikes targeted Khulna and Mongla. A PTI message is supposed to have read, "Chittagong harbour abalze as ships and aircraft of the (Pakistan) Eastern Naval Fleet bombed and rocketed. Not a single vessel can be put to sea from Chittagong". Air strikes staged from Vikrant continued till 10 December 1971. Given naval intelligence that indicated the intent of the Pakistan Navy to break through the Indian Naval blockade using camouflaged merchant ships, Vikrant's Sea Hawks struck shipping in the Chittagong and Cox's Bazar harbours, sinking or incapacitating most merchant ships there. The Hughes 269 helicopter was previously in service for training. The BAE Sea Harrier inducted in the 1980s operated from INS Viraat. until March 6, 2016, The BAE Sea Harrier FRS Mk.51 / T Mk.60 flew with the INAS 300 and INAS 552 squadrons of the Indian Navy. The Sea Harriers are armed with the Matra Magic-II AAM and the Sea Eagle Anti-ship missiles. The aircraft were upgraded with the Elta EL/M-2032 radar and the Rafael Derby BVRAAM missiles. The Naval Aviation Museum located in Bogmalo, 6 km (3.7 mi) from Vasco da Gama, Goa, India showcases the history of the Naval Air Arm. The Mikoyan MiG-29K program was revived by Russia in response to the decision of the Indian Navy to acquire the Soviet aircraft carrier Admiral Gorshkov. As reported by MiG Bureau, the Indian Navy's association with the MiG-29K began in Apr 2002 when a team led by Commander Gupta reached Moscow to evaluate the MiG-29K prototype for possible induction into the Indian Navy. The Team evaluated the aircraft on ground as well as in the air (the flight evaluation was conducted by a Navy Test Pilot Commander Ahuja). Some other aircraft were also evaluated but the MiG-29K was chosen. On 20 January 2004, the Indian Navy signed a contract for 12 single-seat MiG-29K and 4 two-seat MiG-29KUB. The first MIG-29K for the Indian Navy took flight on 22 January 2007. The MIG-29 KUB (two-seat trainer) is similar to the MIG-29K but with reduced operational range. The aircraft will be fielded on the aircraft carrier INS Vikramaditya. The first squadron, INAS 303, christened "Black Panthers", was commissioned on 11 May 2013. The delivery of the aircraft to the Indian Navy started in 2009, and by July 2015, 33 had been inducted, with 12 more to be delivered. The fighter plane is different from the MiG-29 flown by Indian Air Force. The aircraft has been modified for aircraft carrier operation by hardening the undercarriage. It also has much better 'over-the-nose' vision to make it easy to land aboard a carrier at a high angle of attack. Modifications made for Indian Navy requirement featured Zhuk-ME radar, RD-33MK engine, combat payload up to 5,500 kg (12,100 lb), 13 hardpoints (inclusive of the multi-lock bomb carriers), additional fuel tanks situated in dorsal spine fairing and wing LERXs, increased total fuel capacity by 50% comparing to first variant of MiG-29 and an updated 4-channel digital fly-by-wire flight control system. With special coatings, the MiG-29K radar reflecting surface is 4–5 times smaller than of basic MiG-29. Cockpit displays consist of wide HUDs, 3 colour LCD MFDs (7 on the MiG-29KUB), a French Sigma-95 satellite GPS module and Topsight E helmet-mounted targeting system compatible with the full range of weapons carried by the MiG-29M and MiG-29SMT. New Delhi and Boeing have signed a $2.1 billion contract to deliver 12 P-8I Neptune for anti-submarine operations. The new aircraft will replace a fleet of Russian-manufactured Tupolev-142M planes. P-8I varies from the P-8A, with the Magnetic anomaly detector (MAD) has been kept intact while an aft-mounted radar provides 360-degree aerial radar surveillance capability. Many of the communication and other devices on-board are developed by Bharat Electronics Limited. The first squadron was formed with eight aircraft. When the remaining four join the force, the Tu-142 will be decommissioned. Indian Navy operates 5 Il-38 planes but two were lost in a mid-air collision in 2002. Currently they are being upgraded to use the Sea Dragon suite. Dhruv of the Indian Navy. HAL Dhruv; developed by Hindustan Aeronautics Limited, the Navy received its first Dhruvs on 28 March 2002. It is expected to receive a total of 120 units to replace the Chetak helicopters in service. The naval variant is fitted with the Super Vision-2000 maritime radar, capable of detecting targets with low radar cross section at a range of 200 km (120 mi). The anti-submarine version of the helicopter is fitted with dunking sonar, torpedoes, depth charges. The helicopter may also be fitted with the missiles for anti-ship roles. However, in 2008, Indian Navy pronounced Dhruv unsuitable for its role as an ASW platform. Indian Navy will continue to procure Dhruv as a multi-role utility platform. During the commissioning ceremony Vice Admiral Sinha said that "In the Navy, Dhruv helicopters has transformed into an advanced search and rescue (SAR) helicopter also used for missions like heliborne operations, and armed patrol with night vision devices. Such machines in the inventory have become imperative for the Navy given the scenario of low intensity maritime operations (LIMO) and coastal security construct." In 2013 Indian Navy showed keen interest in the armed version of the HAL Rudra. Impressed with the Dhruv's sensors which were able to track ships and also read their names at ranges of 12 to 14 km (7.5 to 8.7 mi). The Navy may induct 20 more helicopters into service. Kamov Ka-25, Kamov Ka-28, and the Kamov Ka-31: The Ka-25 was acquired by the Indian Navy in 1980 for anti-submarine warfare, but had severe technological limitations. The Ka-28s were acquired in the mid-80s, and were said to be a quantum leap over their predecessors from an ASW standpoint. The Ka-31 takes the Kamov capabilities even further by enabling real-time network-centric warfare for the Indian Navy. A Sea King assigned to the destroyer INS Mumbai. Westland Sea King and the Sikorsky SH-3 Sea King: Used principally for anti-submarine warfare (ASW) and search & rescue roles, the helicopter fleet operate from INS Garuda (Kochi) as well as INS Shikra air stations. US sanctions on India in response to India's nuclear tests resulted in a large part of the Sea King fleet being grounded for want of spare parts. Seventeen of the Sea King helicopters will be upgraded. The upgrade will feature day and night capability, capability to work in adverse weather conditions, integration of two anti-ship missiles with a range of fifty kilometres and a new radar. Aérospatiale SA 316 Alouette III: Also known as the Chetak, these choppers have seen active service in the Navy as well as the Coast Guard. They are carried on several combatant as well as non-combatant ships. They are also operated from and maintained at the INS Shikra and INS Utkrosh Naval Air Stations in Mumbai and Port Blair respectively. The Indian Navy operates at least two squadrons of Heron and Searcher Mk-II UAVs, based in Kochi (INAS 342) and Porbandar (INAS 343). There are plans to have at least two more squadrons of UAVs. UAVs are controlled from ships to increases the range of surveillance. There are plans to introduce rotary UAVs into the Indian Navy. These UAVs will have higher endurance and load carrying capability resulting in better reconnaissance capabilities. HAL Tejas: The naval variant of the Tejas will have strengthened landing gear and other necessary modifications for service on an aircraft carrier. Trials are being carried out at the Shore Based Test Facility (SBTF) constructed at the naval airbase INS Hansa in Goa. The Indian Navy plans has a requirement for 40 or 50 Tejas to equip two front-line squadrons to operate from aircraft carriers INS Vikramaditya and INS Vikrant. The Indian navy has placed an order for its first six Tejas at an approximate cost of ₹1.5 billion (US$20.9 million) per aircraft, the total order amounts to ₹9 billion (US$125.2 million). In December 2016, the navy rejected the aircraft stating that it is too heavy and with the underpowered engine is unsuitable for carrier operations. HAL HJT-36 trainer aircraft to replace the older HAL Kiran. Pipistrel Virus SW 80 – Indian Navy ordered total 12 Pipistrel Virus SW 80 to train its cadets. Medium Range Maritime Reconnaissance Aircraft: The Indian Navy issued an RFP for six medium-range maritime reconnaissance (MRMR) aircraft. The possible contenders are; the ATR-72MP/ATR-42MP, the EADS C-295MPA/C-235MPA, the Dassault's Falcon 900MPA and the Embraer P-99A. The procurement number has been enhanced to 9 as per news reports in February 2012. ShinMaywa US-2: The Indian Navy intends to acquire 12 US-2 amphibian aircraft for conducting long-range search-and-rescue operations at cost of $1.65 billion. Two US-2 will be directly imported and remaining 10 will be assembled locally in India. In April 2018, Mahindra Defence signed an MoU with ShinMaywa Industries Ltd. to manufacture and assemble the aircraft, and set up MRO facility in India. "Multi-Role Carrier Borne Fighters": In late January 2017, the Indian Navy released an international Request for Information (RFI) for 57 "Multi-Role Carrier Borne Fighters" (MRCBFs), asking for responses by mid-May. The envisaged roles include shipborne air defence, air-to-surface attack, buddy aerial refuelling, reconnaissance, electronic warfare, etc. The requirements are flexible, including single- or multi-engine, short take-off but arrested recovery (STOBAR) or catapult-assisted take-off but arrested recovery (CATOBAR), or both. Armaments are to include a gun plus four beyond-visual-range air-to-air missiles and two all-aspect air-to-air missiles. Other technical capabilities and inclusions are to be assessed. The main contest is between Boeing F/A-18E/F Super Hornet and Dassault Rafale-M. In August 2017, the Indian Navy floated request-for-information for 123 naval multi-role helicopters (NMRHs) and 111 naval utility helicopters (NUHs). The IAI-HAL NRUAV is a requirement for an unmanned helicopter capable of conducting ISR missions. In June 2017, US administration cleared sale of 22 Sea Guardian drones to India. Flag Officer Naval Aviation (FONA) controls training, maintenance and other functions of naval aviation. Aircraft yards at Kochi, Kerala and Dabolim, Goa are responsible for maintaining the fleet's air arm. An exclusive base, INS Shikra for helicopters was commissioned in Mumbai. To protect and preserve India's growing trade with Southeast Asia and offer a defence against increasing Chinese naval presence in the Bay of Bengal, a new naval base is being built near Visakhapatnam. It is expected to be capable of harbouring two aircraft carriers, including the planned new Vikrant-class aircraft carrier. There are two more naval air stations, INS Rajali and INS Parundu in Tamil Nadu. Southern Command has at least one airfield, INS Garuda, in Kochi, Kerala. The Hindu reported on 2 February 2009 that a new airbase will be set up in Muscat, Oman to tackle piracy in the Gulf of Aden. Three years later in 2012 it is not clear whether any action has been taken on this proposal. The southernmost naval air station, INS Bazz was formally opened on 31 July 2012 by the Chief of the Indian Navy at Cambell Bay in Andaman and Nicobar Islands. With the commissioning of this station, the country acquired increased capability to keep vigil on the vital maritime channel of the Straits of Malacca. ^ "The Naval Air Arm". The Indian Navy. Archived from the original on 28 December 2014. Retrieved 21 July 2014. ^ Indian Navy Information Resource and Facilitation Centre (18 May 2006). "Indian Navy Information Resource and Facilitation Centre – Content". Irfc-nausena.nic.in. Archived from the original on 28 December 2013. Retrieved 27 June 2013. ^ Baranwal, Sukhdeo Prasad (1971). ''Military Year-book'' – India 1965. Retrieved 27 June 2013. ^ Bishop, Chris; Chant, Christopher (15 October 2004). ''Aircraft Carriers: The World's Greatest Naval Vessels and Their Aircraft'' By Richard Jones, Chris Bishop, Chris Chant, Christopher Chant. ISBN 9780760320051. Retrieved 27 June 2013. ^ ''Students' Britannica India'' By Dale Hoiberg, Indu Ramchandani. 2000. ISBN 9780852297605. Retrieved 27 June 2013. ^ Sun, 04/01/2009 – 21:45. "Sankalp India Foundation – "What happened during Operation Vijay (1961)?"". Sankalpindia.net. Retrieved 27 June 2013. ^ "YouTube documentary". Youtube.com. 13 April 2007. Archived from the original on 11 April 2016. Retrieved 27 June 2013. ^ "YouTube". Archived from the original on 17 January 2016. Retrieved 6 February 2015. ^ "Indian Navy prepares to retire its Sea Harriers". Janes. Archived from the original on 26 March 2016. Retrieved 28 March 2016. ^ "INAS 300 retires Harriers". Press Information Bureau. Archived from the original on 3 June 2016. Retrieved 11 May 2016. ^ "Indian Navy retires Sea Harriers". Defense News. Retrieved 28 March 2016. ^ "MIG-29 FULCRUM (MIKOYAN-GUREVICH)". Fas.org. Archived from the original on 16 May 2008. Retrieved 27 June 2013. 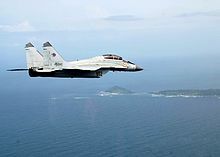 ^ "First MiG 29 K for Indian Navy takes off". Indianexpress.com. 23 January 2007. Archived from the original on 25 January 2007. Retrieved 27 June 2013. ^ "Livefist: EXCLUSIVE: Navy's MiG-29K Squadron To Be Called "Black Panthers"". Livefist.blogspot.com. 28 August 2009. Archived from the original on 2 September 2009. Retrieved 27 June 2013. ^ Pandit, Rajat (11 May 2013). "Commissioning of Mig-29 K squadron". Economictimes.indiatimes.com. Archived from the original on 17 January 2016. Retrieved 27 June 2013. ^ "Navy's MiG-29K superior to IAF's SU-30MKI". Archived from the original on 24 September 2015. Retrieved 6 February 2015. ^ Diplomat, Franz-Stefan Gady, The. "India Inducts First Squadron of Anti-Submarine Warfare Plane". thediplomat.com. Archived from the original on 9 November 2016. Retrieved 25 June 2016. ^ "IL-38 collision threatens Indian surveillance capability". aviationweek.com. Archived from the original on 11 February 2017. Retrieved 10 February 2017. ^ "Indian Navy Commissions First Advanced Light Helicopter (Dhruv) Squadron". 12 November 2013. Archived from the original on 17 January 2016. Retrieved 6 December 2015. ^ "The Indian Navy's first Advance Light Helicopter (ALH) was commissioned at Kochi". dna. Archived from the original on 9 December 2015. Retrieved 6 February 2015. ^ S. Anandan. "Navy keen on weaponised Dhruv". The Hindu. Archived from the original on 20 May 2014. Retrieved 6 February 2015. ^ "Sea King". Archived from the original on 12 May 2008. Retrieved 20 May 2008. ^ "India to Upgrade 17 Sea King Copters for $300M". Retrieved 6 February 2015. ^ "Eye in the sky to guard Gujarat coast". The Times of India. 18 January 2011. Archived from the original on 22 January 2011. Retrieved 18 January 2011. ^ "Navy to commission UAV squadron at Porbandar". Zee News. Archived from the original on 12 January 2011. Retrieved 6 February 2015. ^ "domain-b.com : Birds of a different feather". Archived from the original on 23 September 2015. Retrieved 6 February 2015. ^ "Maritime surveillance capability needs to be strengthened: Mehta". The Hindu. Archived from the original on 16 May 2013. Retrieved 6 February 2015. ^ "Indian Navy developing new generation UAV". Archived from the original on 15 April 2008. Retrieved 5 June 2008. ^ "Gorshkov delay stalls carrier trials of naval LCA". Archived from the original on 12 January 2009. Retrieved 6 February 2015. ^ "Indian Navy fastens its seatbelt for Light Combat Aircraft Tejas". dna. Archived from the original on 26 September 2012. Retrieved 6 February 2015. ^ "Navy places Rs 900-cr order for 6 Tejas LCA". Rediff. 21 September 2009. Archived from the original on 6 February 2015. Retrieved 6 February 2015. ^ Peri, Dinakar (3 December 2016). "Navy says no to Tejas variant". Archived from the original on 21 December 2016. Retrieved 17 September 2018 – via www.thehindu.com. ^ "Navy rejects Tejas, says 'overweight' fighter does not meet its requirements - Times of India". Archived from the original on 6 December 2016. Retrieved 8 December 2016. ^ "IAF to get 40 more Hawk AJTs". The Hindu. Archived from the original on 26 October 2012. Retrieved 6 February 2015. ^ "HAL's Star Trainer reputation goes into a tailspin". Archived from the original on 17 January 2016. ^ The Financial Express (12 October 2015). "India inks Rs 130-crore deal for 194 microlight aircraft". financialexpress.com. Archived from the original on 17 August 2016. Retrieved 7 August 2016. ^ "India approves USD 1.5 billion aircraft deal for Navy – Brahmand News". brahmand.com. Archived from the original on 3 June 2015. ^ "Aero India 2015: ShinMaywa confident of progress on US-2 sale to India". Jane's.com. Archived from the original on 29 April 2015. ^ "DefExpo 2018: Amphibious Aircraft US-2 to be made in India". 11 April 2018. Archived from the original on 11 June 2018. Retrieved 11 April 2018. ^ "Mahindra, Shinmaywa Industries' tie-up; hope to make US-2 amphibious plane for Indian Navy". 11 April 2018. Archived from the original on 12 April 2018. Retrieved 11 April 2018. ^ Bedi, Rahul (1 February 2017). "India issues RFI for 57 carrier-borne fighters". Jane's Defence Weekly. 54 (5): 6. ^ "It's Official: Indian Navy Wants 57 Carrier-borne Fighters - Livefist". www.livefistdefence.com. Archived from the original on 2 March 2017. Retrieved 1 March 2017. ^ "India to float $5bn tender for 234 naval choppers: Here is all you need to know". 23 August 2017. Archived from the original on 7 November 2017. Retrieved 6 November 2017. ^ Sputnik. "India Floats Biggest Tender for Procurement of 234 Naval Helicopters". sputniknews.com. Archived from the original on 7 November 2017. Retrieved 6 November 2017. ^ "IAI completes unmanned helicopter development work". Archived from the original on 8 December 2015. ^ "US approves sale of 22 Guardian drones to India". 23 June 2017. Archived from the original on 23 June 2017. Retrieved 21 December 2017. ^ "Navy chief calls for enhanced preparedness". The Hindu. Archived from the original on 3 November 2012. Retrieved 6 February 2015. ^ "Naval air base to tackle piracy". The Hindu Business Line. Archived from the original on 6 November 2010. Retrieved 6 February 2015. ^ "Naval air station opened in Campbell Bay". 1 August 2012. Archived from the original on 2 August 2012. Retrieved 1 August 2012. Wikimedia Commons has media related to Aircraft of the Indian Navy.